The jeep took us to the second highest drivable pass in Colorado today. What an amazing ride! 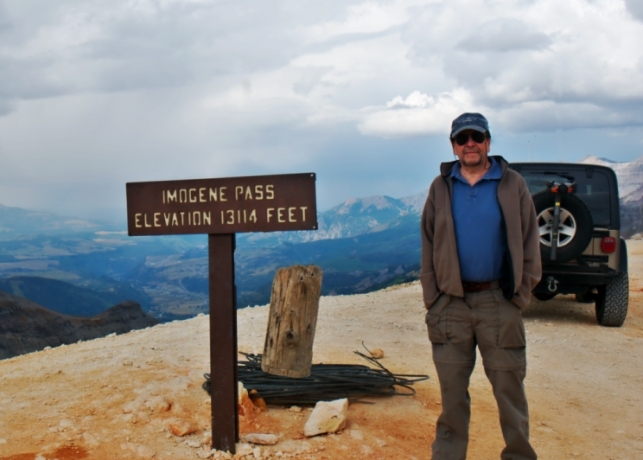 It is technically rated as moderate but…….the steep rocky shelf roads, the tunnel, the snow, rain and the altitude of 13,114 feet. Flickr will have some new posts of pics from this ride. We began the off-road in Telluride and ended on the other side of the mountain range in Ouray. The road passed the Tomboy Mine, Torpedo Eclipse Mine and the Camp Bird Mine. There is a lot of history of the mining industry to be seen on this trail. Yes, Brad did have that grin on his face the entire ride….